Now a New York Times number one bestseller, The Great Alone by Kristin Hannah is a daring, beautiful, stay-up-all-night story about love and loss. The Great Alone is perfect for all those who loved The Light Between Oceans, and fans of Jodi Picoult, Victoria Hislop and Diane Chamberlain. 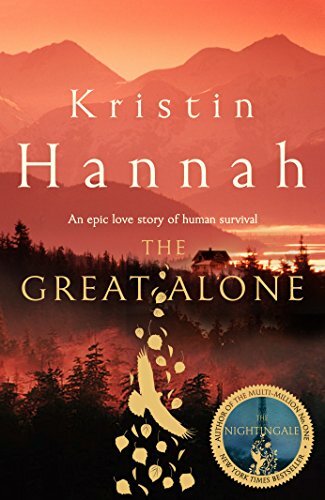 In Kristin Hannah’s The Great Alone, a damaged vet named Ernt Allbright returns from Vietnam and moves his family to the wilds of Alaska to start their lives anew. Initially it’s a welcome change, but as winter approaches, and Ernt’s mental state deteriorates, his wife and daughter find themselves in an increasingly precarious position. Leni and Cora are the heart of what is as much a mother-daughter love story as it is a pressure cooker of a page-turner. Together they reckon not only with the elements, but with some bad decisions, born from the stubborn faith that Ernt will somehow be restored to the person he was before the war. It’s a testament to Hannah’s compassionate storytelling that you’ll be hard-pressed to call him a villain; Ernt actually shares the same Achilles heel as the rest of the Allbright clan: they do not know how to ask for, or receive, help (so much so, you just want to shake them). Fortunately the cavalry comes anyway, including a homesteader named “Large Marge” who doesn’t suffer fools (or domestic abusers). The muse of The Great Alone is clearly Alaska–in all its untamed, stunningly beautiful, dangerous glory. It provides the perfect backdrop for an equally dramatic tale, one that feels remarkably current for the 1970s setting. But Hannah’s latest also harkens to her mega bestselling The Nightingale: it highlights the heroics of everyday people, especially women. And it’s just a damn good read. Set in 1974 Alaska, this sweeping tale follows a girl coping with the dangers of domestic violence. Though ill-prepared for the extreme and harsh conditions, 13-year-old Leni and her parents, Ernt and Cora, have to learn how to survive in the unforgiving wild of their new home on the Kenai Peninsula. With the help of the small-knit community of endearing fellow homesteaders, the Allbrights manage to just barely stay afloat. But Ernt, who has never recovered from the trauma of fighting in the Vietnam War, struggles with the isolation and the interminably dark days of winter. Leni grows up witnessing her father (who is increasingly unable to control his paranoia and jealousy) abuse her beloved mother. Leni’s greatest comfort and escape is her schoolmate and neighbor Matthew. Over the years, their friendship evolves into a forbidden romance. Hannah highlights, with vivid description, the natural dangers of Alaska juxtaposed against incongruous violence. VERDICT Give to teens who loved the author’s The Nightingale and to fans of Jodi Picoult. SO depressing. Per the usual, Kristin Hannah has created layered, fleshy characters and an engrossing story, but you really need to be in a good place emotionally to read this one. While many of her books are bittersweet and run the gamut of life’s emotions, this one is pretty bleak cover to cover. If all is stable and calm in your world and you read it from a place of peace and emotional homeostasis, or you need a catalyst for a bawl fest, go for it! It’s certainly an engrossing read and very well written. But if you have a lot on your plate, or more than a bit of emotional stress in your life at the moment, steer clear. Perhaps the fact that it has had such a strong effect on my state of mind is a testament to Ms. Hannah’s storytelling abilities, but I’d unread this, at least for the moment, if I could. I’m so exhausted and bummed out from reading this, I’m having a hard time getting out of my pjs this weekend! Additionally, there are a couple of areas where the plot line is a real stretch, but I think it’s so well-written overall that those things can be overlooked. Still a very good book, but good grief!